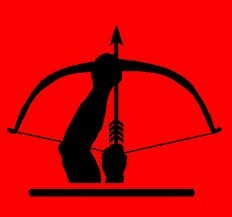 Rawreth Gunsite and P O W Camp often referred to locally as "The Gunsite" or "Rawreth Camp" was located on what is now Rawreth Industrial Estate. The entrance to the camp was in Rawreth Lane by means of a narrow concrete road, a short part of which is still extant, having been designated as a public footpath, just before the turn off for Makro and the Industrial Estate. I think that originally it was built solely as a heavy anti aircraft gun site and was only used to house POWs towards the end of the war, when the threat of enemy aerial attack was almost nonexistent. It was one of 27 heavy anti aircraft gun sites on the north side of the Thames all prefixed with the initials TN (Thames North) which stretched from Dagenham to Foulness. Rawreth was TN4. After the war it was put on a care and maintenance basis with a resident caretaker, Mr Millard, whose main job I believe was to maintain the guns. His son, the late Len Millard was a classmate and friend of mine so I was allowed to visit and play there. The layout of the camp is clearly shown on the 1961/65 post WW2 1: 2500 map on the old-maps website. 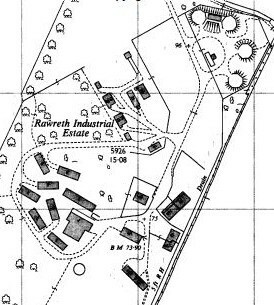 Whilst being named as Rawreth Industrial Estate it only shows all the original military buildings and constructions. RDCA-Admin ... Please note that old-maps.co.uk is now commercial and it is no longer possible to get magnified images for free such as the one shown here. From the end of the remaining section the original road then followed the route of the present road. Just beyond the sharp bend were the gates. You had to ring on a bell push on the gatepost and a bell would ring in the caretaker's bungalow and someone would come up and let you in. Quite a hike especially if the weather was bad! Just inside the gates was the guardhouse, a small brick building with a pitched roof. Directly beyond this was a flat roofed concrete building with green painted steel shutters and doors which I was told was the armoury. Then came the compound that housed the four heavy anti aircraft guns. There were two sets of gates into the compound. The fence and gates were very high, similar to the chainlink fencing often seen around tennis courts. These gates were always locked and possibly there was a guard dog in there, although I’m not sure about this after 60 years. The guns were similar to naval type guns and were mounted in concrete emplacements with ammunition magazines with steel doors built into the walls. The outside of the emplacements had earth banked up against them. I do not know what other buildings were in the compound as we were never allowed inside it, but do recall that it was immaculately maintained with the usual whitewashed stone edging so beloved of the military in those days. There may well have been generators to power the mechanism of the guns as I doubt that they would have had to rely solely on the public electricity supply. As I recall the guns were painted dark blue. I remember on several occasions seeing the gun barrels pointing skywards, presumably when they were being serviced, but never heard them fired although they probably were many times during the war. Carrying on past the gun compound, the road curved round and on the right hand side was a small brick construction which Len used to call the paraffin store. You then came to a fork in the road. In the middle was a Nissen hut which had a single width louvered door. I did get a peek inside this in the early 70s. There was no indication as to what it had been used for, although there was a fuse board where a cable came up from under the ground with ”Guns” marked on it. The road again forked here to the right and a short spur led to a small concrete flat roofed building. Ahead of this were two roofless buildings and then another small flat roofed concrete building, which I think may have been ammunition stores or possibly some type of air raid shelter. Opposite these buildings was a Nissen hut with double doors at one end and two single width doors at the other. Alongside it was a concrete construction with a toilet in it. Next door was another flat roofed concrete building with green painted steel shutters and doors. I was later told that this was the main control/plotting room for the guns and that there was a large map on the wall showing the local area. In front of this was a strange concrete construction, which consisted of a concrete ramp leading up to a low walled platform. There was a room under this building. I have no idea of its purpose. The ramp seems to indicate that something had to be wheeled up it. Maybe a small search light, or range finder? Returning to the other fork in the road the next buildings were a pair of semi-detached bungalows on the left hand side, the first of which was occupied by Mr Millard. I think he also had an assistant who lived in the other one. These were built at a lower level than the road and you had to go down some steps to the front doors which were at the side. Across the road was a single detached bungalow. Presumably these were originally quarters for the CO and other higher ranking officers. Carrying on down the hill, on the right hand side, before the first of the brick built army buildings were a number of large concrete shields set in the grass with the badges of the various units that had been stationed there. According to my map, there were only twelve red brick built buildings. I know most of these were identical. One at the bottom of the hill just off to the left of the road was the camp hospital. Next to this was a large concrete static water tank. There was also a single width gate to a footpath which went to Victoria Avenue. At the bottom of the hill on the right hand side as the road curved round was a large ablution block with showers etc. It may also have had a small brick built water tower, although I can’t really remember. The next building along from this had been used as a camp theatre, whether for the prisoners or previously for the soldiers stationed there I do not know. I can remember that there was some scenery stored inside and also painted on the wall in big letters was “Rauchen Verboten” (Smoking Forbidden). There may also have been some tents and bedding etc stored in some of the other buildings, none of which seemed to be locked. I suppose that in those days people did not venture onto MOD sites for fear of prosecution and at that time vandalism was almost non existent, at least in the Rayleigh/Rawreth area! Whilst I have no idea when POWs were first housed there, the Essex Sound and Video Archive contains an account of supervision of German POWs from Rawreth Camp doing agricultural work at Rettendon. SA24/488/1. This may give some indication of dates. The POWs also gave concerts at the camp and invited local families for whom they worked, so I suspect that this was after the War had ended. As to numbers and whether they were housed in the brick buildings or tented accommodation, I have no idea. I believe that before the arrival of the Germans there were Italian POWs there. The POWs used to make toys and other items which they exchanged with the locals, presumably for cigarettes etc. After the departure of the POWs, Displaced Persons (DPs) were housed there. I remember one boy in my class at Love Lane named Peter who came from Czechoslovakia, but can’t remember what year. I don’t think he was there for very long. Once the camp was put on the care and maintenance basis, the army would return for a few days now and again and we were not allowed there during that time. I well remember seeing a convoy of army vehicles going along Down Hall Road, the lead vehicle being a Hillman or Austin Utility (Tilly). The vehicles all had a regimental badge on the wing, which again I recall and it was that of Anti Aircraft Command. Round about 1954 the four guns were removed and transported away on Pickford's low loaders. By 1957 the site had been returned to Mr Gunn. I found reference to a planning application submitted to Rayleigh Urban District Council for change of use to Industrial, and the council approved this but stipulated that some of the buildings should be preserved. There are two or three still in existence at the southern end of the site. (One is the old ablution block, which was later used as a furniture factory) Essex County Council also made representations to Rochford District Council regarding the preservation of these buildings in respect of the latest plan to build hundreds of homes on the site and surrounding fields. This page was added by Sid Barker on 30/09/2014. We are sisters of Len Millard of whom you mentioned in your article. We lived at the gun site approximately 1953-1955. The layout of the camp is as you described except you didn't know what the concrete ramp was for. It was put in to accommodate the radar which they used for training purposes. Our father, Ernest Millard, was the site caretaker (gun artificer). The guard dog you mentioned was our family dog. His name was Rustler (an Alsatian), he was kept in the gun emplacement that you mentioned in your article. Next to the shower block was the cook house. The troops used to come in at weekends for manoeuvres and they would bring the radar equipment with them and put it on the concrete ramp that you described. We have two photos of the bungalow we lived in. It was called "Greenacres" and they were taken just before it was demolished. Hope this has been of interest. One or two even retain their original cast iron windows. I think you are right about both, but I worked out that if you go to the Old-Maps website, type in Rawreth in the search box and when the map comes up move it until the marker is roughly over the industrial estate and click on it. A menu of available maps comes up on the right side. Click on the one you want and after it loads, click again to magnify it. It's a bit hit and miss and I must admit I can't always get it to work and have had to keep persevering. You could try typing in coordinates 579578 192396. Impressive Sid, wish my memory was as good as yours! I tried to get a look at the map you reference (1961/65 post WW2 Rayleigh Industrial Estate) and listen to the audio recording about POWs (SA24/488/1). Seems as if they are unavailable unless you subscribe respectively to Old Maps or to the Essex Records Office.